GeigerCars isn’t anything unknown. This German company based in Munich has doing tuning for many years only to real American cars as Hummer, Chevrolet Corvette, Ford Mustang or Dodge Viper. Every car from their workshop is unique. We’ve brought you some of their creations before and today we’d like to show you one of their newest cars. It’s the „smallest“ brother of Hummer family called Hummer H3, codename Alpha. So now, it’s not a usual „hammer“, especially after this modification. It’s something special. How it’s possible? It was simple – a total rebuild of stock Hummer – wheels, paintworks, interior and engine...everything you can remember of. So first thing you notice for sure are wheels. Yes, these rims are big, very big. The bigger, the better. 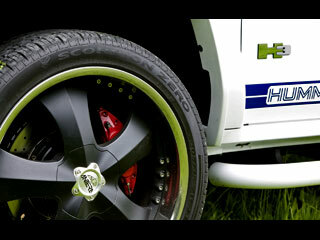 Tuners compete to install better rims on the Hummers, so GeigerCars want to be first too. There are five-spoke 23“ alloy rims with black center and chromed hem wearing 305/35 R23 rims. But who wants more, you can buy 305/35 R24 rims. Behind the rims we can see big vented brake discs to stop these 2.3 tons of mammoth muscles in every situation. But not only brakes were changed. GeigerCars installed a sporting chassis that decreases the car’s height and improves stability and handling in high speeds or tight curves. The tuners say that the Hummer H3 isn’t only a luxurious SUV but off-road too. But we know that with 23“ rims you can’t fight with some heavy terrain. The H3’s engine was improved too. Now the 5.3 liter V8 aggregate produces 300hp of raw power. Its top speed is 124mph (about 200kmph). This was achieved thanks to software change of engine and transmission, sporting air filter and complete stainless exhaust system with two exhaust tips producing beautiful sound. So we’ve describe you whole engine and technical information, but we still have a „usual“ Hummer with usual color, but beautiful wheels. So GeigerCars continue in the complete visual change of the exterior. The most important change is a new color. White color is still stylish, so this car is white too. But there’s not only white color all over the car, so we can see a simple blue strip in the middle of the car. 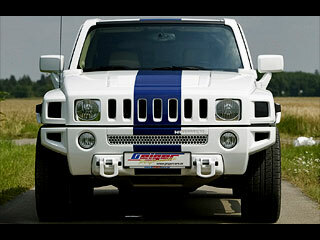 There are other strips with Hummer GT brand on the H3’s sides. But what’s strange? Almost everything is white. So there’s no characteristic chromed mask, it’s white too, similarly as exterior mirrors and all plastics on the car. If you think that bumpers are different, you’re wrong. All bumpers are original, but the car „lost“ its spare wheel from the rear doors and roof rails. But GeigerCars added decent fender’s hems, white side steps and sunroof. Former orange blinkers are black, so tail lamps are dark. Side blinkers aren’t stock, but improved model that is higher. Tinted glassed are compulsory on the scene. And that’s all about the exterior. GeigerCars doesn’t forget so the interior offers everything necessary for your comfortable ride in leather seats, surrounded with carbon parts and listening to complete hi-fi with satellite navigation. It’s interesting that every head-restrain includes a stand-alone DVD player with display. It’s true that ecologists hate big, thirsty American mammoths, but maybe not this one. GeigerCars offers an ecological system of natural gas available in every Geiger’s model. After its installation you can say goodbye to carbon black and save 20% of emissions. But the most important is that you save your money. You need only one half of your wallet than before. It’s definitely a very interesting project of GeigerCars. They didn’t fail and introduce something amazing. Now the youngest brother is better and we’d like to see something similar in the near future again. 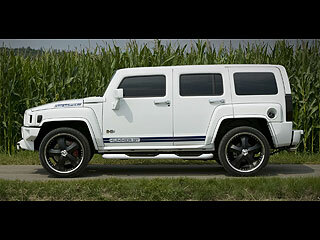 What is your opinion on Hummer H3 GT from Geiger Cars?